Dollar signs filled my 12-year-old mind as I gazed, fascinated, at the hundreds of chicks scurrying under the heat lamps at the farm-supply store. The store’s annual chick days had arrived with Easter, and so had spring fever, attacking the farm folk with vigor after the cold, dark winter. Chirping with all the enthusiasm of new life, the helpless little chicks seemed proof that warmer days were coming, and thoughts of an egg business ran through my young entrepreneur’s mind. Assuming each chick would eventually lay an egg a day, I quickly convinced myself of the profit I’d make selling eggs, but more than the money, I wanted an excuse to own some of the fluffy creatures myself. Having no clue that the tub of chicks marked “pullets” would grow up to be hens while the “straight run” tub contained both sexes, I carefully stuffed my cardboard box with the cheaper, unsegregated chicks. As I gleefully handed my money to the cashier after collecting all the feed and dispensers I thought I might need, I had no idea that I’d already made my first mistake. It was weeks later when I realized that a large proportion of the chicks I had selected would never lay eggs—they were roosters. Although I was born a city kid, my homeschooling parents valued the lessons and responsibility the outdoors could teach us. Because of the hands-on learning opportunities we inevitably encountered, they always encouraged me and my seven younger siblings to pursue our interests in real activities instead of wasting our childhood on video games and Facebook friends. After relocating to a larger property when I was eight, we accumulated quite a few animals, despite the fact that my parents had no former experience with them and we had to build our pastures and barns from scratch. I loved animals, especially farm animals, and I was already responsible for our herd of miniature horses and donkeys, which we kept in the backyard along with a brush-eating goat, a pig, honeybees, some ducks, and a dog. I’ve since concluded that donkeys are one of the world’s best teachers of patience, second only to temperamental computers, and maybe sewing machines. After emptying my cardboard box of chicks from the farm-supply store into a Rubbermaid tub in my bedroom, I dug out an old heat lamp out of my closet that we’d picked up at a garage sale years before. Then my little brothers dumped their boxes of chicks into tubs in their bedroom and acquisitioned the lamp from my mom’s nightstand and one from the living room to use as heat lamps. Of course my egg business sounded like a good idea to them, too, and we had to put our own chicks in separate tubs because we were all starting separate businesses with very different strategies for success. As the big sister who had read the how-to books, I was sure my approach would be the best, while my siblings couldn’t care less what the books had to say. A week later, I discovered that one of my otherwise-healthy chicks was unable to walk, and I searched my books determined to find the reason. I felt guilty when I learned that his “splayed legs” were a condition often caused by raising chicks on slippery newspaper, as I’d done, rather than wood chips. This wasn’t our first plunge into the world of chickens. My siblings had given them a try before, with only temporary success, and a couple of years earlier, a kind lady friend had given me six fat, ancient hens, which never laid a solitary egg the entire time I dutifully kept them. 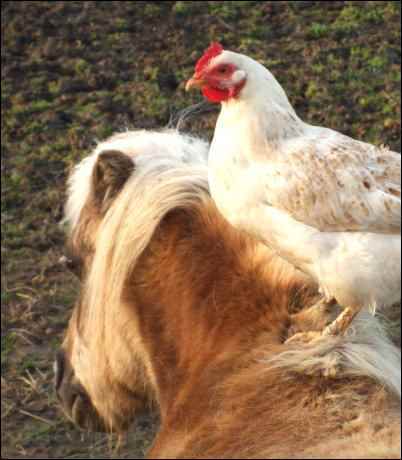 I learned the hard way that the saying about not looking a gift horse in the mouth doesn’t apply to chickens. The same year, my family spent an unforgettable day at an animal auction where one of my parents unknowingly bought a flock of incurably-diseased hens (that later had to be destroyed) and a grouchy old duck, while a kind stranger stopped my other parent and me from buying a goat with a bad case of mastitis (infected udder). With the help of our new friend, we bought a healthy dairy goat in milk instead. When a baby miniature horse suddenly showed up in the auction ring, somehow mixed in with the dairy goats, he was so cute that we had to buy him, too. We managed to fit all our newly-acquired animals into our 15-passenger van along with all my siblings and spent the 2-hour drive home listening to the squawks and neighs coming from the backseat and petting the goat tied in the aisle way. The miniature horse turned out to be the cutest cart-pulling, kid-toting stallion you ever saw, after about four years of trial-and-error training, a few broken harnesses, and countless tumbles from his short back. As I mentioned, the sick hens came to a very unfortunate, untimely demise, and after faithfully milking the goat for quite some time, I was eager and determined to try yet again to raise an egg-producing flock. I’d already constructed my chicks’ future home, a moveable, bottomless structure divided into a house and a wire-covered run, commonly called a chicken tractor. When my chicks finally feathered out, I excitedly moved them into the chicken tractor, which I’d spent weeks researching and building with scrap materials, even removing old nails from the boards to straighten out and reuse. Watching the delighted youngsters pecking at the grass, I felt convinced that all my effort would soon be recompensed in fresh eggs by the dozens. Little did I know! Letting them out each morning during the summer to scratch around, I figured I was saving on feed and raising healthier hens. What I didn’t realize was that hens need a properly-balanced diet to persuade them to lay regularly, and what mine were finding on their own wasn’t quite right. Winter came, and I’d still only collected a few tiny eggs. According to my books, they should have been laying regularly by this time. I convinced myself that it was just the cold weather, and it truly was cold; too cold for the hens in their little hut in the snowdrift. The sliding door that I was so proud of designing iced shut and the whole structure solidly froze to the ground, imprisoning my poor hens inside. Feeding and watering was nearly impossible. In desperation, I ran a few extension cords out to their coop from the house so they could have a heat lamp, but a few of them didn’t survive the winter. When the first signs of spring began to show, I hoped that soon I would receive a return of eggs for my investment, which had accumulated to quite a bit of money after feeding my hungry flock all winter, in addition to the few mice that helped themselves. Doing chores one morning in early spring, I was surprised to see a bloody carcass and strewn feathers in my chicken pen instead of one of my hens. Obviously, a predator had somehow managed to squeeze itself inside. I was devastated. Despite my best efforts to patch up any holes where a predator might get in, the same thing reoccurred a few days later. A year after purchasing my chicks, I had only a few chickens remaining to show for my work and money, and I nearly gave up hope of ever having a successful egg business. My first attempt hatched three chicks, after 21 days of monitoring the humidity and temperature and turning the eggs three times a day, but two of the chicks died within hours. After the surviving one met with a fatal accident at an early age, reality hit me. The idea of an egg business was obviously not working. I’d based my calculations on my hens each laying an egg a day, but the hens I still had were now adults and they still didn’t lay well, and thoughts of the approaching winter revived memories of the devastating effects the last one had had on my flock. Slowly, I began to understand that the method I was using wasn’t the right fit for a large flock of layers in my cold, damp climate. Realizing that something had to change, I read every book I found, studied every flock I saw, and interrogated every chicken owner I met. It paid off. A chicken tractor, designed to be lightweight and portable, wasn’t the right house to overwinter my flock in. 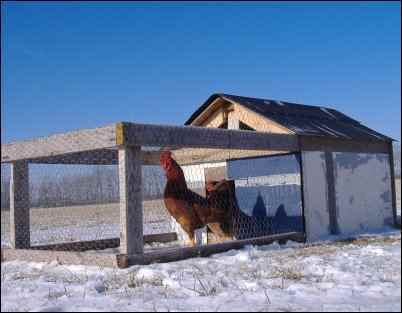 While great for raising meat birds over the summer, housing a setting hen, or containing a few chickens for a backyard 4-H project (the books touting their virtues aren’t totally wrong), chicken tractors didn’t meet the fundamental needs of my flock of layers in a cold climate. Because I learned that my hens needed a roomy home with lots of light and ventilation, a dry, clean floor, protection from predators, and a stable temperature all year round, I set to work remodeling an old garden shed in the backyard into my new chicken palace. A few years and dozens of eggs later, I concluded that the business of egg production really was profitable and that chickens really do lay eggs every day, if they’re young, happy hens in a dry, comfortable, well-lit coop with plenty of the right food at their disposal and a bucket of water that isn’t frozen solid. They don’t need to require a lot of maintenance, either. While I usually visited my coop once a day to collect the eggs, I was able to leave them for a week at a time with the peace of mind that they’d be just fine when I got home. Of course, there’d be a pile of eggs to deal with when I returned. Alternatively, it only took a minute to explain their management to someone else if I wasn’t going to be around to do chores. There’s no reason why you can’t enjoy fresh eggs by the dozens, either. 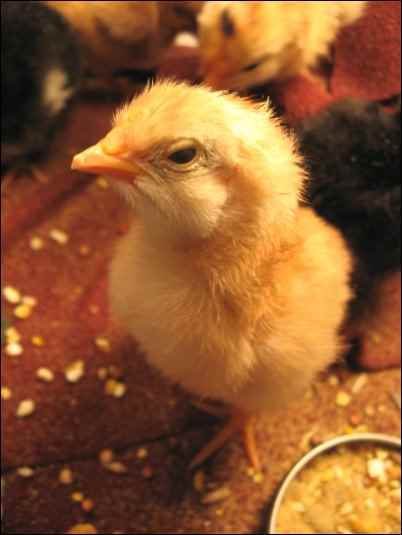 The main things to keep in mind when deciding how to house your flock are: light, moisture (in wet climates particularly), temperature, food and water, ventilation, predators, and sufficient room. With those areas correct, you’ll be on the right road to an easily managed flock of egg-layers! 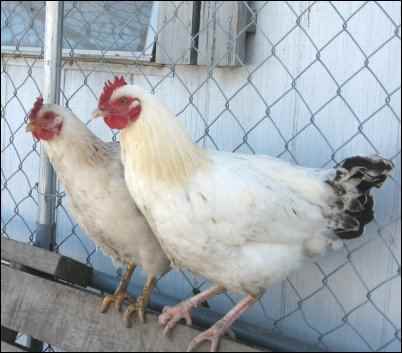 Hens absolutely must have enough hours of sufficient light in order to lay eggs. If they’re cooped up in the dark, they simply won’t lay. Usually, 14 hours a day of either natural or artificial light is considered the minimum, while 15 to 16 hours is optimal. Skylights and opening windows covered with predator-proof netting kept my coop bright all year, while also providing ventilation. Although excessive moisture won’t be an issue for everyone, I found that in my area a straw-covered wooden floor elevated off the ground was almost essential. Compared to the problems I’d faced in my bottomless chicken tractors with freezing, muddy, soggy-wet chickens, shoveling out the straw and manure in their new coop every few months was no big deal. Having a floor also helps with temperature control, as does ventilation, which in turn helps prevent excessive moisture. With plenty of room, lots of possible problems, including disease and fighting, are lessoned or even prevented altogether. In the end, I had to give my hens free access to commercial layer-feed at all times to keep them laying regularly. At times, this even meant limiting how much they free-ranged by letting them out of the coop only in the afternoon or once every couple of days, because otherwise they wouldn’t eat enough layer-feed. Honestly, this was hard for me to accept at first, because I hadn’t planned on getting my own chickens just to keep them cooped up and feed them commercial feed. Nevertheless, I had to admit that even if they weren’t free ranging every single day or living exclusively off of bugs (actually, they preferred to peck at the produce in my garden), their conditions were incomparably superior to the hens in the commercial egg factories. My hens’ eggs had yolks the color of the bright orange tree leaves in autumn, not to mention strong shells that sometimes didn’t even break when I accidentally dropped the eggs on the ground because my hens had laid more than I could carry. I hoped to lessen their consumption of commercially-prepared feed by allowing them to free-range all the time, but repeated attempts failed each time. Finally, I resigned myself to feeding pellets and constructed a large wall-mounted dispenser that held 100 pounds of feed and dispensed more as the chickens consumed it, so I only had to refill it every month or two. To my delight, I discovered that even my problems with frozen water were solved in the new coop because of the warmer temperatures naturally maintained through the superior design. At last, we had eggs enough for the family with plenty to spare. My business ideas changed, so I never sold many eggs, even when we had some to spare. Nonetheless, I felt like finally I had successfully reached the goal that was at the heart of my egg-selling venture: an egg-producing flock. In the end, I had gained much more than some eggs and knowledge of chickens. My flock gave me a lot of practice in things like determination and problem solving, not to mention the biology I studied to find out what made my hens lay and what made the eggs in my incubator hatch, but I also learned some very important lessons, and there’s one I will never forget: it’s a lot harder than it looks to start a successful business. Elizabeth spent her childhood in Ohio, where she was homeschooled by her parents along with her seven younger siblings. Currently residing in the mountains of Arizona, she enjoys hiking, cooking, gardening, music, and beekeeping.